WEN is designed to eliminate the harsh effects of shampoo, without sacrificing the integrity and beauty of your hair. 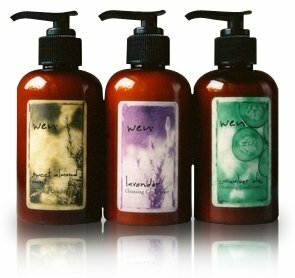 WEN is the only cleanser/conditioner you will need to use in your daily routine, and can be used as often as necessary. The instructions leave you wondering about getting clean hair, but it really does leave my rather oily scalp clean, but not dry. The lavender variety seems to remove the most oiliness. Because of my oily scalp, I haven't yet done the version where you leave the product in your hair after towel-drying, but I'll give it a try. The basic treatment doesn't leave any buildup and the smell is very subtle. The price is perfect, especially when you compare it against salon products that don't do half as good a job. Even my hairdresser noticed a difference! I have been using WEN for almost a month now and LOVE IT! My hair is fuller, softer, shinier. There is MUCH less hair in the shower drain and my hair is much thicker. I had my hair colored, cut, and styled a few days ago and my hair dresser wanted to know what was up and what I was doing. When I told him, he was amazed. This is all I use on my hair and I have given all of my salon shampoos and conditioners to my daughter. I saw a commercial for Wen and, of course, hoped that the product would do wonders for me. I actually have used conditioners to clean my hair for several years after reading a book called "Curly Girl" where the author quit using shampoo and cleaned her hair with conditioner instead. It is not a new concept to do this. I was just hoping for a superior product and my daughters wanted to try Wen as well. First of all, my daughter complained about the smell of the cucumber aloe conditioner. I thought it couldn't be that bad, and then I tried it and understood immediately what she meant. It smells like menthol in cough drops or Vicks Vaporub. Yuck! I had taken the cucumber aloe with me on vacation before trying it and actually went out and bought a new conditioner at a drugstore. It made my hair frizzy when I used it and when I got home and went back to my old Paul Mitchell leave in conditioner, I was much happier. I was skeptical of getting hooked on an expensive product that only made a marginal difference. However, I think this product is worth the money. I am pretty low maintenance and was hesitant to get into a prolonged daily shower routine -- with working in 20 pumps of product and then having to leave it in for 5 minutes. Quite frankly my typical shower doesn't last that long. I was worried this would add too much to my daily prep time to be feasible. It doesn't. I have about shoulder length very fine hair. I get it colored bi-monthly and blow dry it daily. It can get a little fried. Using Wen has added volume to the top of my head --- where with regular shampoo and conditioner it usually laid limp. It also has made my hair so smooth and soft I like to run my fingers threw it. I'm not a walking hair shampoo commercial -- strangers don't stop me on the street -- but my best friend noticed and thought it was a new cut. She commented on the volume and and body. I have only used the lavendar thus far, and I use about 7 - 8 pumps in the shower. Then I add a small pump to the ends after I've towel dried. I know other postings mention playing around with the different types and the amount of product used. I'm pretty busy (and a touch lazy) so I haven't done much experimenting --perhaps my ideal type any quantity may yield even better results. I have read all the reviews posted on these products. I purchased the 3 pack variety of lavendar, cucumber/melon and sweet almond mint about 2 months ago in the 6 ounce size. A little background -- 2 years ago I had major surgery which left my once fairly thick hair very thin, especially on top, and very dried out. My hairdresser had recommended many types of shampoos, conditioners, leave in treatments, etc (very costly stuff to say the least) and still every time I would go in to the salon she would talk about how damaged my hair was. I saw this product advertised on one of the TV shopping channels and thought at first "I can't pay that much for something that might not work." Then, I started adding up what I had already spent on products that didn't work and thought "What the heck; let's give it a try." So, having now very fine hair I opted for the 3 variety pack for fine to medium hair. Once I received the items (quickly too), I first tried the cucumber/melon. I followed the directions that come with the product to the letter. Two months later, I no longer hear from the hairdresser that my hair is so damaged I must try yet some other product that she recommends to the tune of so much more money than this product costs. I am still using the same 6 ounce bottle of cucumber/melon, so needless to say this product last a long time. I also put about 5 pumps of the lavender in a spray bottle with water for touchups between shampoos. I even use this on my 2 and half year old granddaughter after we've been in the swimming pool to comb out her hair which is very thick. She likes the way it smells and doesn't mind "nani" combing her hair out anymore since "it doesn't hurt." My hair is so much softer, has more body, and although it is still very thin on top, I no longer have to endure comments about how damaged my hair is.